Have a certified HVAC technician inspect your Heat Pump to make sure that it is running to 100% efficiency. Make sure the filters are clean. An inefficient unit will struggle to keep your home comfortable and cause your electric bill to skyrocket. If your home utilizes Natural Gas or fuel oil, have a certified Master Plumber inspect your boiler to make sure it is in peak working order. He will check things like the bearings in the recirculating pump, the level of water in the expansion tank, and any electrical connections. Bleeding air out of radiators will help ensure that the entire heating system is operating efficiently. In cases where there is too much air in a particular radiator, this will prevent the hot water from traveling through the system causing that radiator to feel cool or even cold when the heat is on. Have a knowledgeable person evaluate the attic insulation. Upgrade if that is the recommendation. Having adequate attic insulation will help ensure that the envelope of the house is protected, keeping the heat in and the cold out. Just as important as adequate attic insulation is proper attic ventilation. Make sure that outside air can travel freely through the attic. The air should be pulled in from soffit vents and exit through the gable vent or ridge vent. Improper attic ventilation will cause your heating system to overwork itself and lead to higher than normal heat bills in the winter months. Take the time to walk around the exterior of your home. Pay attention to items like caulking around windows and doors. Cracked or missing caulk will lead to water intrusion and air intrusion. Re-caulking with a good quality waterproof caulk with fix these issues. Visually inspect the outside of your foundation walls. Look for cracks or missing mortar. Fixing these times will help prevent water intrusion and air intrusion. If your home has wood trim on the exterior, look for wood rot or missing pieces. The trim boards are installed to cover gaps at corners and around windows and doors. Rotten boards should be replaced or repaired. If you can safely access your roof, inspect any/all flashing to make sure it is sealed. Again, the goal is to prevent water from getting to areas it is not supposed to get too. Inspect walkways and driveways for cracks. These should be sealed to prevent water for getting in and freezing. Be mindful that whenever water or air gets where it is not intended to get, the envelope of the house is compromised. Gutters and downspouts seem to be a constant problem in the winter months. Before winter sets fully in, make sure the gutters and downspouts are free of debris. Also, make sure that the gutters and downspouts are secured to the house. 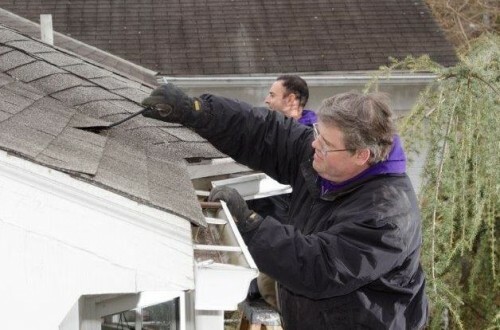 Loose gutters and poorly connected downspouts will cause water and ice to cause serious damage. Ideally, if the attic insulation is properly done, this should prevent ice dams. However, if gutters or downspouts are clogged, ice dams will most likely happen. Ice dams occur when ice forms inside the gutter and or downspout. Heat from the attic escapes through poor insulation and melts the underside of the ice. This water cannot drain out through the blocked downspouts and leaks back into the house. Ice fused inside the gutter also weights a lot. This can cause loose gutters to be ripped away from the house. Please remember to turn off the outside hose bib shut off valve and then leave the hose bib itself open. This can prevent the water supply line from bursting. Also, inspect your dryer vent ducting. Make sure this is clear and that the mesh is in place and secure to prevent animals from seeking warmth as the temperature falls. Evaluate exterior lighting as it pertains to walkways. Making sure that the lights are working can help prevent a fall in slippery, frozen conditions. Check the insulation around doors and windows. Make sure that the insulation is still pliable. 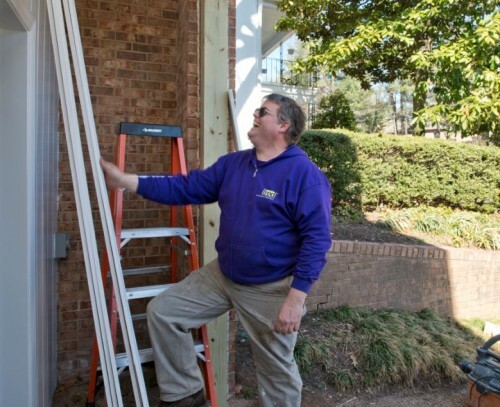 If the weather stripping around windows or doors is brittle or broken, have it replaced. This will help seal the house envelope from the cold. It is important to prepare your home for the winter. Take the time to take a good look at the existing conditions. Seek professional help if something looks wrong or is in need of repair. Addressing all of these items now will help your heat bills and reduce possible damage.